It took him two hours to finish the diagnostic. I waited nervously for his verdict. "I want you to get a piece of paper and a pencil," he said. I did so immediately. "I want you to write this down," he said. I nodded. "Lemi Shine. That's L-E-M-I S-H-I-N-E."
"You can get it at Albertson's grocery store." I wrote that down too. "Now, here's what you do. You get the Lemi Shine and pour a thin layer of it in both compartments of the detergent dispenser. Then you get a powdered detergent like Cascade and you put a thin layer of that over it. Close the dispenser door and start your machine." He stood there while I transcribed this too. All of it. Every word that came from his mouth. He packed up to go. "So that's all I need?" I asked. "There's nothing wrong with my machine?" He looked around nervously. "In 99 percent of cases in this area, it's the hard water that causes problems. I still have to check out the machine, see, and I'd probably be trouble of mentioning the Lemi Shine, but that's all you really need." He left, as quickly as he'd come, leaving me only with memories of our time together and that memo he'd had me write to myself. At least I had that. I went in search of the Lemi Shine, found it, came home and followed his directions exactly. I opened the door to my dishwasher, NAY! I opened the door to a whole new world!!! Clean dishes from my dishwasher! I knelt at the open door and nearly wept. Indeed, a miracle had occurred. Even the glasses that had been foggy for years were crystal clear. In a fervor, I took it upon myself to be the ambassador of this good news. I told the women of the book club. I told my friends. I pounced upon people just lingering in the aisle of the dishwashing detergents and told them of this miracle powder. 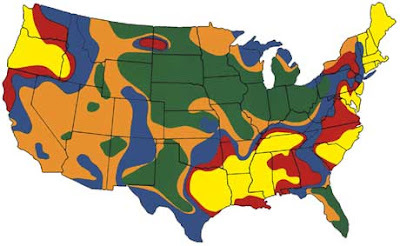 *Your key to Water Hardness Map above.